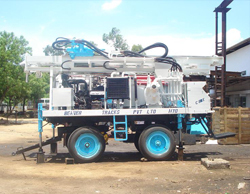 BEAVER 650T Model, Trolley Mounted Hydraulically Operated Water Well Drilling Rig can capable of drilling from 4.5” to 6” Dia. Bore Holes in different formations such as hard rock by DTH method & Unconsolidated / alluvial formations using water / foam flush by Rotary method up to a depth of 200 Meters (650 Ft.) under favorable Drilling Conditions. The hydraulic pumps shall be powered a separate diesel drive deck engine. Accessories / Optional Attachments : Welding Set, Winch with jib and boom arrangement on the top of the mast.